I am just hoping the person who is receiving this gift today is NOT reading this post before she gets the gift! If so, well, HAPPY BIRTHDAY MS. SUSAN ! This is a hanging mini book just ready to be filled with fun thoughts and memories. Each page is made from a unique medium. 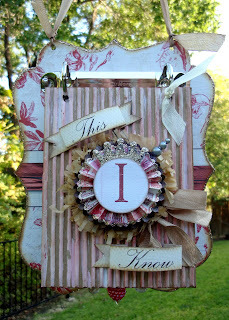 I wanted to show you the cover because it utilizes one of my favorite dies - the Rosette. I cut two of them and just trimmed the second one a bit smaller. Then I stacked them. And of course edged them both with Stickles! So I am off to deliver this little gift. I'll be back tomorrow with a cheery little card for you.